When I had to decide on what to write about for the British Invaders blogathon the choice was a blissfully simple one. 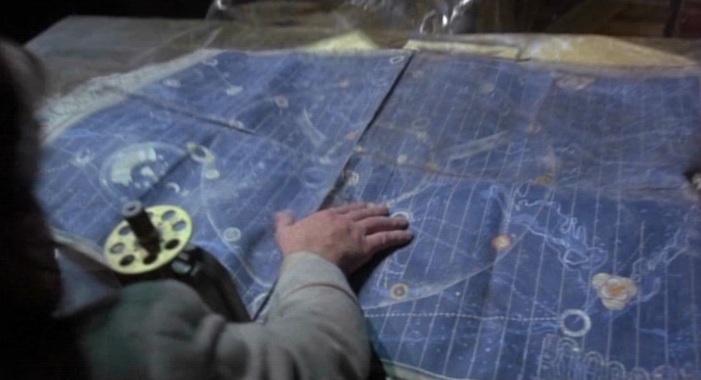 Time Bandits came to mind almost right away, and thankfully was available. It’s a film I’ve seen quite a few times, that I find quite funny and does not seem to be discussed often enough. It’s also, when thinking of British cinema one that comes instantly to my mind. So, the what to write about selection was easy. How I chose to write about a film that quite easily fits the theme as it does deal with a band of invading time-traveling thieves was another question. 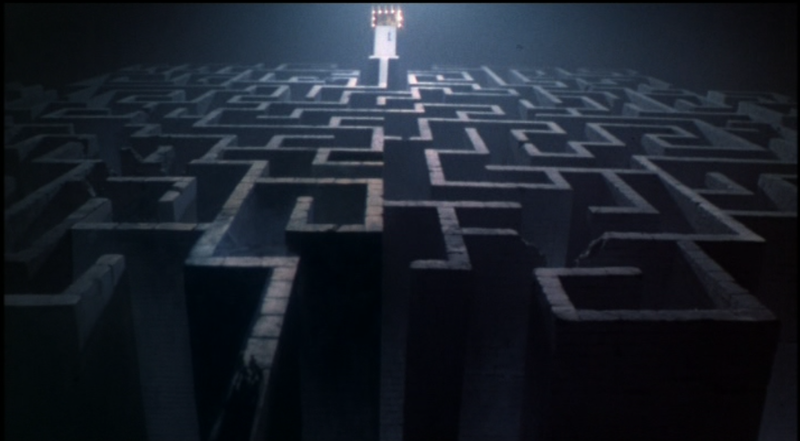 Seeing as how the story flows in a series of vignettes that coalesce to have a centralized conflict, I think a more free-form examination of the film from a number of different angles would be highly appropriate. 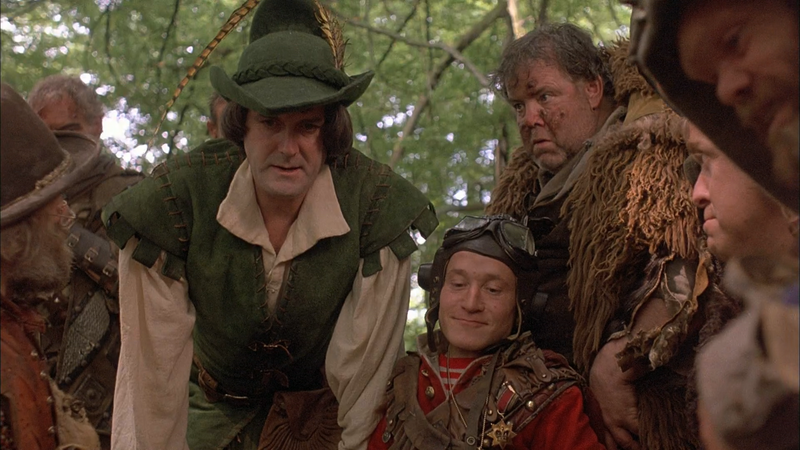 When you look at Gilliam’s filmography (one I’m not as familiar with as I should be) you see that Time Bandits kind of falls directorially towards the end of the Monty Python films and before Brazil, which may be why it’s at times under-discussed. In fact, I had not seen much professed love for it until it was reported that it was being developed as a remake/reboot that would become a children’s fantasy/adventure film series. I was kind of disappointed to hear that as well, but I have since then reached a sort of peace with remakes. I can dislike something conceptually, and grumble about its happening, but can judge the film on its own merits. Similarly, why is it in an ever-changing medium that stories cannot be revisited it seems? In theater there are remakes, but they are respected and referred to as revivals. All popular artforms are commercialized, conglomerated and globalized new packages on old ideas are nothing new. However, in the ever unpredictable world of film development nothing has come of it as of yet, But it does have an In Development IMDb listing. It may have been misplaced (but that’s highly unlikely) but when I went to revisit this film I did not find the DVD of it on my shelves. But I had to see it again to be able to say anything meaningful. Sure enough it was available on Amazon Prime. With all the talk of what streaming or membership options there always seems to be a myopia. I take advantage of Prime as many ways as I can. I should do a study at some point to see what I’m getting out of my $99/year fee. As I re-watched it struck me that the film wasn’t in the greatest shape. I’m unsure if its just degradation over time that could be restored or if a bad print was used like the original DVD of The Neverending Story. Regardless, it’s a film that I will nominate for enrollment in the National Film Registry this year. One thing that struck me as I rewatched this film is that it’s another case of time traveling and vignettes really working for me; including once in a play I wrote. It’s not the most commonly used trope, but it is one I’ve seen a few times and one I enjoy quite a bit. Another example that comes instantly to mind was The Annunciation, the first film adaptation of the classic Hungarian stageplay The Tragedy of Man. It came to mind because of that fact and some of the time periods visited are the same also. The differences aside from language are the approaches to the tale, the comedy styles (there is some in both) and the order. 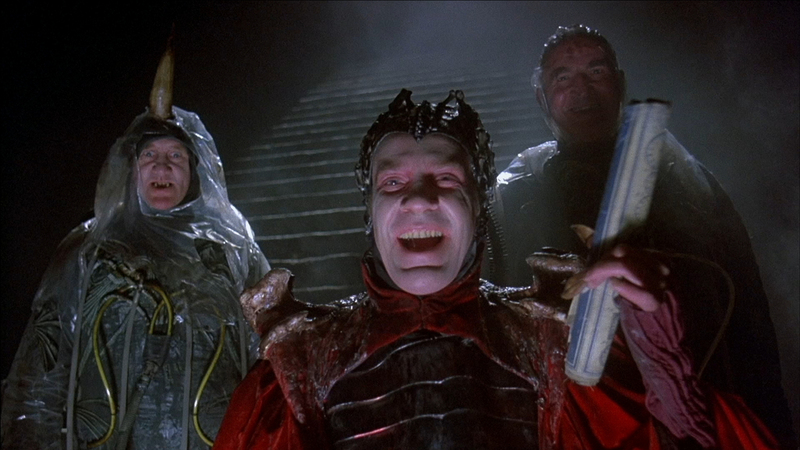 The time bandits do not always go in the same order and Gilliam even fashions one non-historic time period. The precise order is: Napoleonic Wars, Middle Ages, Ancient Greece, Titanic, Time of Legends which leads into the climactic showdowns. The Napoleon segment had me hearkening back to Love and Death, which is Woody Allen’s take on Napoleon’s invasion of Russia amongst other things. In Ancient Greece our young protagonist, Kevin (Craig Warnock), finds a new father figure in Agamemnon and some of the more dazzlingly surreal images come forth but there are quite a few. Their brief stint on the ill-fated Titanic is a reappearance of the underrated Shelley Duvall, and it continues a gag of her character being referred to as Pansy. It’s also one of many instances where Kevin shows his knowledge of past events as the Bandits are clueless. Due to the tone, narrative and structure of the film there is a natural ability to just forget about the notion of time-traveling paradoxes. There are any number of means to accomplish time travel in narrative devices from the most realistic, in theoretical terms, to fanciful. This film certainly comes out on the more fanciful end of things, which is fine by me because a map to the holes in the fabric of time is just really creative stuff. The aforementioned battle that comes to the fore is one between good and evil over possession of the map. In another interesting turn in this tale there is a God-versus-Satan battle that takes out denominational specifics and instead opts for more archetypal nomenclature and different approaches to visual representation of the two. The Supreme Being (i.e. 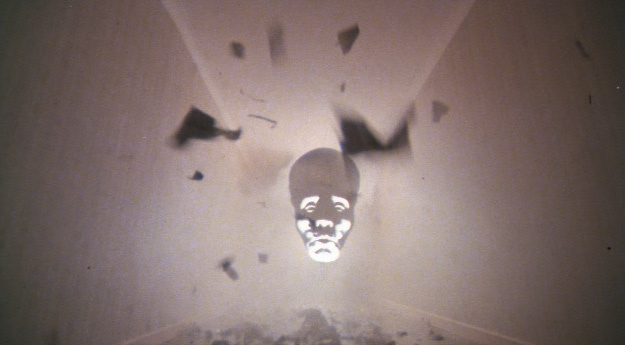 God) is often seen as an Oz-like floating head and at the end appears as an old man in three-piece suit. Evil (i.e. the Devil) is kind of a steampunk/Giger hybrid. 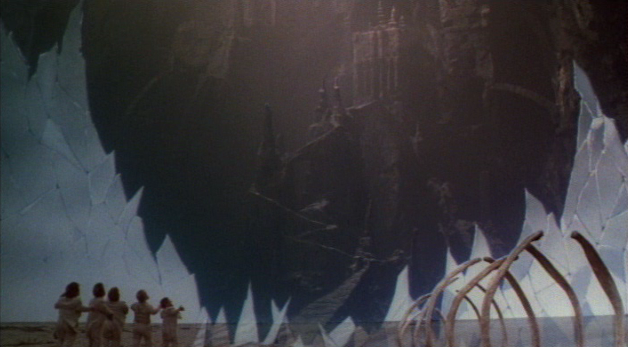 And they fight over both the map, and Evil discusses mastering technologies, which at the time of this film’s making are the latest (and some of it is kind of prophetic), to get the upper hand. Perhaps the two pieces of miscellanea that most demand some looking at are the Moderna Products that feature as a subplot, and the very ending. The Moderna Products are interesting because they play into commentary of consumerism and conglomeration that pervade not just the present day setting of the tale, but also play into the reveal of Evil when Kevin and the Bandits first run into him. There’s an omnipresence of these products on TV and even in Evil’s wheelhouse. It’s one of the pieces of the film that seems more apropos now than then. As for the ending, this film has perhaps the most hilarious closing line in any film. It’s a quote I’ve used quite a bit in real life. The ending with the re-emergence of images and mementos (Polaroids and Connery in another part) also make the veracity of the daydream theory dubious and leaves events open to interpretation, and adds another layer to the comedy. So in the five prior sections I looked at some different aspects of the film, and likely could’ve done more. Clearly, this a film that has stuck with me, though I didn’t discover it as early as I could have. This is also five aspects without examining the film in a traditional review mold. It is a film that finds an orderliness in its self-created chaos and keeps the levels of wonder, creativity and hilarity fairly consistent throughout, and paces itself well such that the two-hour running time doesn’t feel extraneous. 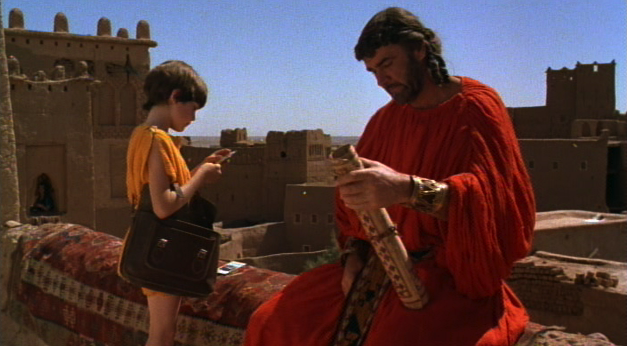 Whether or not the remake does happen I know we’d probably all prefer something new that’s all Gilliam. However, whether or not said remake does happen, the original is still here, stands the test of time and needs a bit more love in the ways described above.